There are so many things that need to fall into place when planning an event or meeting, including finding the appropriate hotel and venue, choosing the correct food and beverage offerings, hiring the best speakers and booking good transportation services. The thing is, none of that can be spearheaded until you’ve chosen the right destination for your meeting. 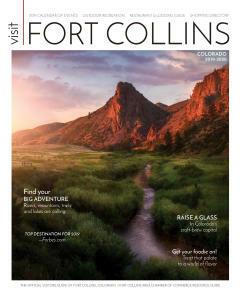 That’s where we come in and introduce you to Fort Collins, the “Choice City.” In this week’s Destination Fort Collins blog we showcase Colorado State University’s Conference & Event Services. What makes Fort Collins the ideal place to hold a meeting? Fort Collins is considered one of the best places to live in America. Here, guests can benefit from 300 days of annual sunshine and incredible views from the campus’ base in the foothills of the Rocky Mountains where extreme rock climbing and water adventures await. The nearby downtown district also offers a great way to enjoy meeting breaks with a diverse cultural hub offering top-rated restaurants, unique shops, and a vibrant nightlife scene populated by one of the biggest craft beer communities in the country. What services does your property offer that make it the perfect spot for conference and events? CSU Conference & Event Services provides elevated event management, financial and registration services both on campus and all around the nation. With over 30 years of event experience, we offer a variety of service packages to suit every program’s needs. The campus itself is contained to one-square mile, offering everything you might need in walking distance and with added safety and security for youth groups and camps. With nature at your feet and adventure on the horizon, Colorado State University is anything but an ordinary venue for conferences and events. Named one of the most sustainable campuses in the world, CSU offers a range of breathtaking LEED Certified Platinum, Silver, and Gold buildings to host inspiring meetings. Recently renovated buildings include the 50,000-square-foot Lory Student Center with 24 state-of-the-art meeting rooms, six ballrooms, and a 500-seat theatre. Other larger spaces include the 20,000-square-foot Moby Arena with flexible arrangements for up to 6,000 people and the brand-new CSU Stadium with 16 rooms for 30-1,200 people, all providing incredible views of the football field and the Rocky Mountains. The campus also touts more than 100 classrooms and lecture halls equipped with SMART technology and A/V provided in-house. The Pavilion is another popular option with a green wall, outdoor amphitheater and fire pit for unforgettable ambiance. In the summer, up to 6,000 beds are available for overnight accommodations, ranging from traditional residence halls to modern suites with air conditioning and private bathrooms, as well as linen service and on-campus parking. What do you suggest attendees do for team building, evening activities or spouse programs? Fort Collins is this unassumingly hip northern Colorado college town that prides itself on the plethora of restaurants, outdoor activities, family fun, diverse cultural attractions, a vibrant downtown, and of course, our beer. With campus being walkable from Old Town, the downtown heart of it all, that is a great spot for activities of all sorts, and did I mention brewery tours, because… the beer. With places like Horsetooth Reservoir and Cache La Poudre River being a short car ride away, groups can enlist one of the many local adventure companies for diverse recreational resources including boating, hiking, fishing, whitewater rafting, camping, and wildlife watching. Our campus is home to a recently updated Rec Center where guests can enjoy a range of workout and weightlifting equipment, four gyms, a climbing wall, bouldering cave, steam room, sauna, and a full pool with Jacuzzi and lazy river. Lastly (but certainly not least) nestled in a beautiful, secluded mountain valley at an elevation of 9,000 ft., lies Colorado State University’s 1,600-acre Mountain Campus. The Mountain Campus offers an outdoor Challenge Course that is designed to enhance team building and personal growth. Tell us about accessibility, catering options and some unique aspects. There are three options for on-campus catering, offering boxed meals, buffet service, and elegant plated dinners. There are also numerous dining halls on campus with made-to-order stations and every conference actively contributes to environmental efforts through trayless dining halls and compostable food waste that goes back into the community. Less than an hour away from Denver and with shuttle service to and from Denver International Airport, Colorado State University is a convenient meeting destination that has something for everyone.